RINGO was decommissioned on 23rd June 2009 and returned to the UK to be upgraded. The new instrument, RINGO2, is now in use on the telescope; see the RINGO2 page for details. The information presented here is for historical purposes only. RINGO was an optical polarimeter that made use of a novel design first used by David Clarke (Glasgow), where a polaroid is rotated rapidly at 500rpm in the beam of the telescope, creating a time variable signal if the source is polarised. The resulting time-variable signal is converted into a spatial signal pattern by a small-angle wedge prism rotating with the polaroid. This pattern is recorded on a thermoelectrically cooled CCD. 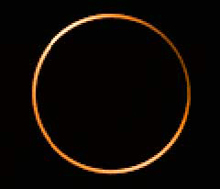 The end result is that each source is imaged as a small ring, with the polarization signal mapped out twice around its circumference. 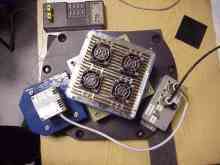 This image shows the basic RINGO setup before the CCD camera would have been attached on top of the centre metal box which contains the polariser and prism. 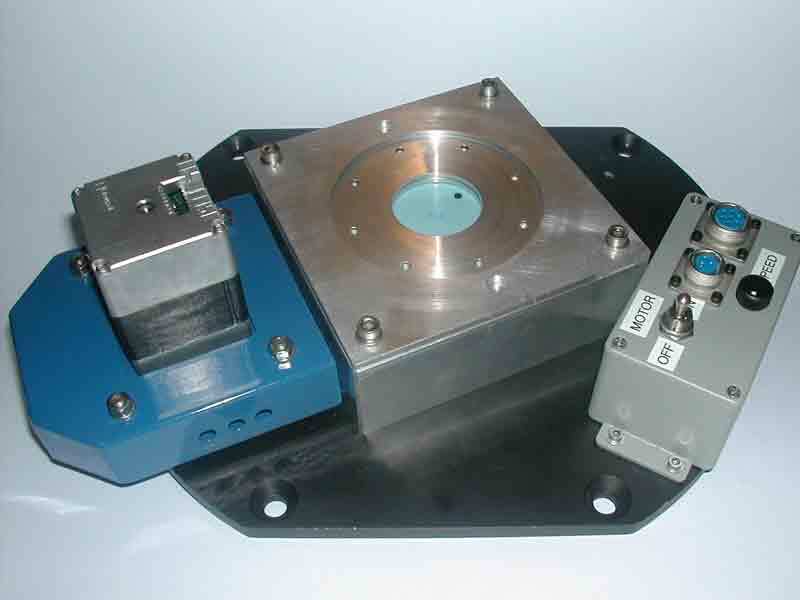 The optical axis runs up through the centre hole, perpendicular to the plane of the table (the blue disc in the hole is a dust cap). 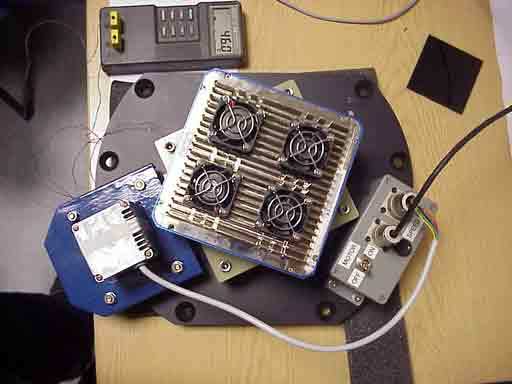 The polariser/prism setup would have been connected by a belt to the motor bearing at left in the blue enclosure. The box at right contained the power supply and speed controls. This image shows the completed RINGO setup complete with CCD camera on top of the rotator assembly that contained the polariser and prism. The black plate underneath was the mounting plate for the telescope. This is the result of a test run in November 2005 when the known polarised star BD +64 106 was imaged with RINGO. CCD AIMO E2V CCD42-40: back illuminated, midband coated. Diagram of optical path through RINGO. 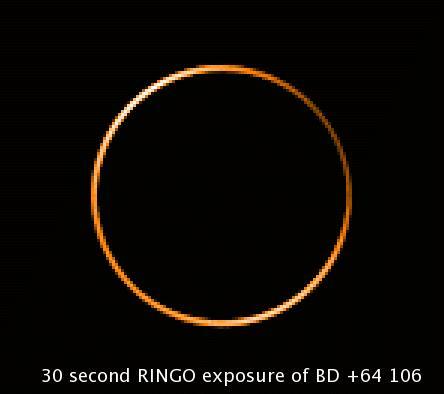 RINGO used a hybrid "V+R" filter, consisting of a 3mm Schott GG475 filter cemented to a 2mm KG3 filter. The resulting bandpass curve is shown below, compared to Bessell V and R filters. Standards are spaced approximately every few hours of RA. Sensitivity curves for the instrument in dark and bright conditions are shown below (click on graph for bigger version). RINGO data were dark subtracted and flat-fielded before being distributed to the user. Error codes were identical to those defined in the RATCam pipeline description. Data which predated the availabilty of the automated pipeline (i.e., prior to March 2007) were only available as raw data. They were not loaded into the main data archive but could be downloaded from Unloaded Data.